3.9x30mm Cross Cut / DIN Security Level P-4 for sensitive, confidential & personal data. More Info. The Fellowes 425Ci is a Large 3.9x30mm Cross Cut office shredder that will also shred CD's/DVD's, Credit Cards, Staples and Paper Clips. It has high performance engineering with a heavy duty motor, which provides continuous use for multiple users in a large office or small department. 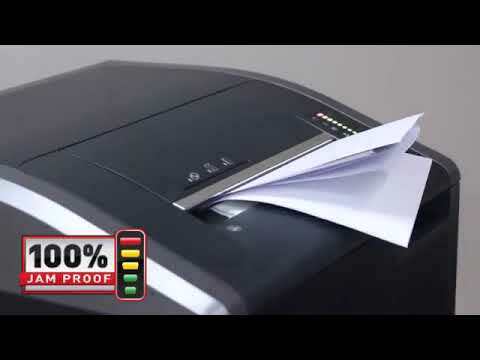 The Fellowes 425Ci model has 100% Jam Proof Technology and will auto-stop and reverse the machine when too much paper is inserted into the entry throat. A colourful visual indicator shows the shredder capacity. The Fellowes 425Ci features an easy to clean auto oil mechanism to keep your shredder running at maximum performance. Continuous Duty Shredding technology also allows for the continuous shredding of paper without the motor over-heating, making 24 hour shredding possible The Fellowes 425i also features Safe Sense Patented Technology that stops the machine automatically if the entry throat is touched, offering ultimate safety in the office environment. A super fast shred speed processes waste quickly reducing 'down time' in the office. This shredder shuts off automatically when the wastebasket is full, the machine is jammed or the door is ajar and alerts the operator with troubleshooting, indicator lights. It also features casters for increased mobility and is very quiet during operation, making it ideal for office environments. There is a handy internal cabinet for the storage of oil, bags and the instruction manual. The use of a P-4 shredder such as the Powershred 425Ci will aid your GDPR compliance.